With butter churned over on big Vancouver Island, garlic from a neighbour, hazelnuts from “up island”, and parsley right from our plant on the deck, this dish was very local. However, I added a bit of olive oil (top turn it into healthful dish!) 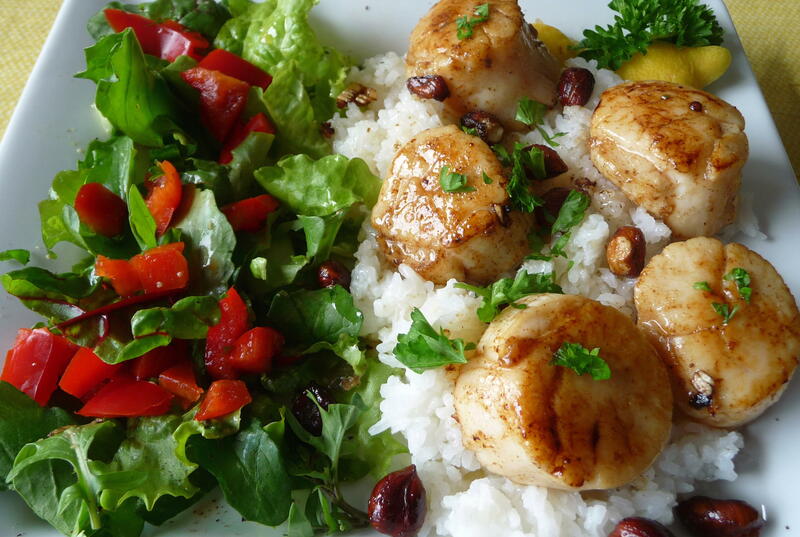 and served the scallops on jasmine rice from Thailand, so it was not strictly a local dish. 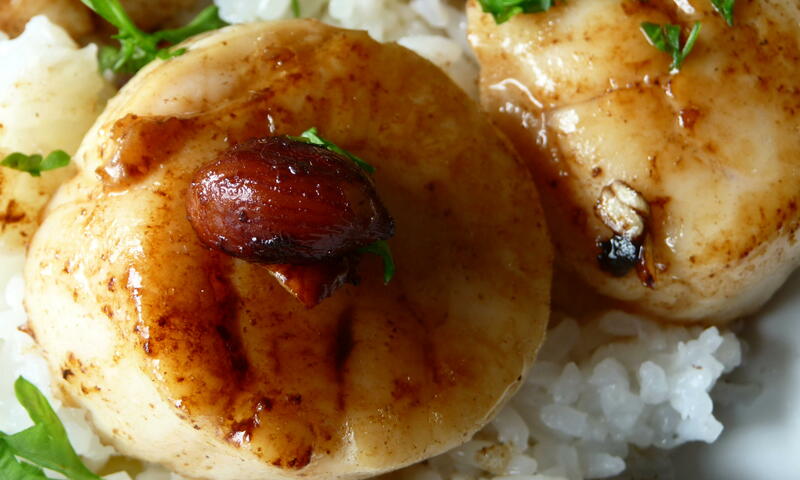 I think the scallops would be equally good on quinoa, pasta, or couscous, tiny or Israeli, you can choose. But it could have been easily a 50-kilometre or so meal. The scallops in brown butter with hazelnuts were rich, satisfying, toothsome, crunchy, buttery, and nutty – a great quick and impressive dish for an early summer weekend meal. Heat butter in medium frying pan, stainless steel or light coloured preferably (to watch browning progress) over medium-high heat. Watch until the colour changes to nut brown and develops brown bits and gives a nutty aroma. Reduce heat to medium. Add minced garlic and sauté for a minute or so. 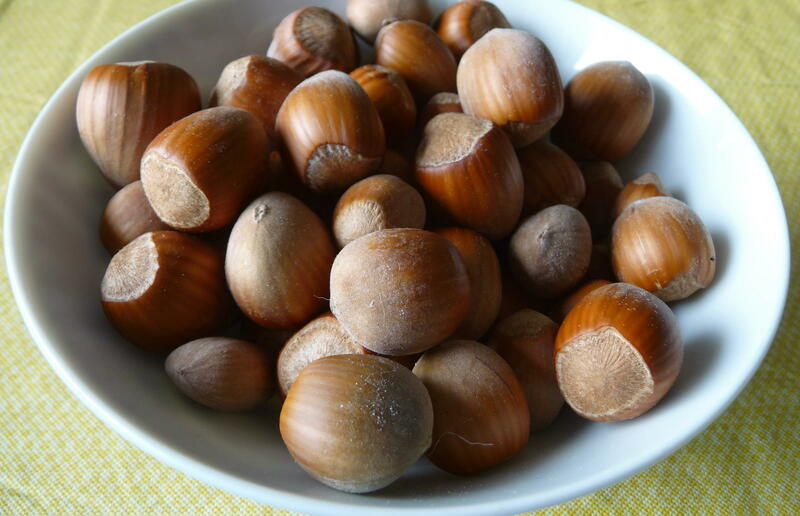 Add hazelnuts to pan and sauté another minute or so, moving nuts around. 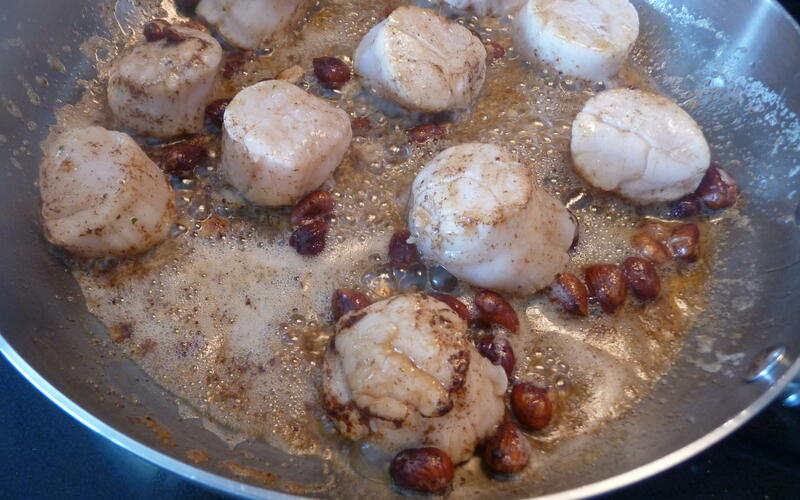 Place scallops in pan and turn after about four minutes, per side. Check after turning over the first time to ensure the consistency is right (like a medium rare steak, slightly soft, with some give, rather than hard and rubbery). Add olive oil to pan, stir, and season with sea salt and fresh cracked black pepper, to taste. Serve immediately over rice (pasta, quinoa, couscous, or ??). Sprinkle chopped parsley over scallops and serve with lemon slices. This entry was posted in Main courses, Recipes Misc, Seafood and tagged Brown Butter, fast, hazelnuts, local, Recipe, Scallops, seafood. Bookmark the permalink. Thanks, Sara. The brown butter also makes it especially voluptuous, as a special dish. It was very nice of you to visit and say such encouraging things! I read this post this morning before I went out to run errands and on my way home saw some beautiful looking scallops in the fishmonger’s. Was SO tempted to buy some so that I could try out your recipe, but sadly the price was miles out of my budget. You can trust that I’m now saving up, as re-reading the post and seeing your photos are creating serious scallop cravings! Delish. Thanks so much for stopping by and the nice remarks!